Commercial and Industrial Activity of Jews. Russian city; capital of the government of Bessarabia; it has a population of 147,962 (1904), including about 50,000 Jews. The Jewish community of Kishinef has taken an important part in the commercial and industrial growth of the city since the eighteenth century, when it became prominent as a trading center. Jewish merchants are intimately connected with the local and export trade in grain, wine, tobacco, lard, wool, hides, fruit, etc., and the trade with Odessa and Austria is largely controlled by Jews. Still more conspicuous is the part taken by Jews in the industries of the city. 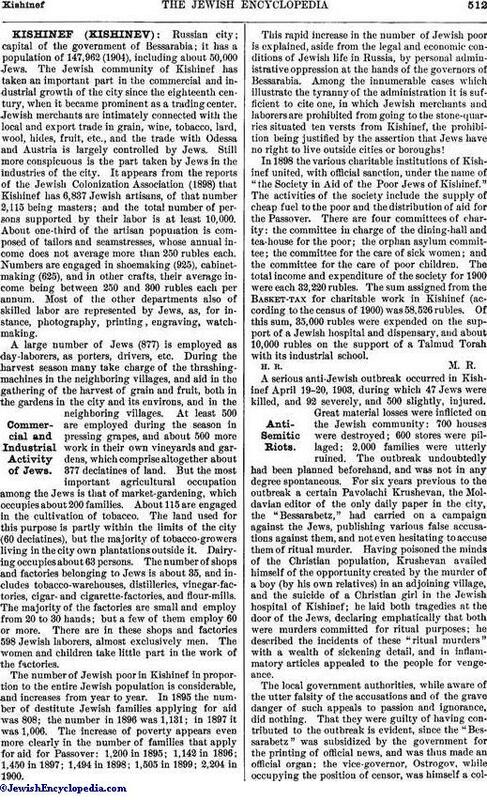 It appears from the reports of the Jewish Colonization Association (1898) that Kishinef has 6,837 Jewish artisans, of that number 2,115 being masters; and the total number of persons supported by their labor is at least 10,000. About one-third of the artisan population is composed of tailors and seamstresses, whose annual income does not average more than 250 rubles each. Numbers are engaged in shoemaking (925), cabinet-making (625), and in other crafts, their average income being between 250 and 300 rubles each per annum. Most of the other departments also of skilled labor are represented by Jews, as, for instance, photography, printing, engraving, watch-making. A large number of Jews (877) is employed as day-laborers, as porters, drivers, etc. During the harvest season many take charge of the thrashing-machines in the neighboring villages, and aid in the gathering of the harvest of grain and fruit, both in the gardens in the city and its environs, and in the neighboring villages. At least 500 are employed during the season in pressing grapes, and about 500 more work in their own vineyards and gardens, which comprise altogether about 377 deciatines of land. But the most important agricultural occupation among the Jews is that of market-gardening, which occupies about 200 families. About 115 are engaged in the cultivation of tobacco. The land used for this purpose is partly within the limits of the city (60 deciatines), but the majority of tobacco-growers living in the city own plantations outside it. Dairying occupies about 63 persons. The number of shops and factories belonging to Jews is about 35, and includes tobacco-warehouses, distilleries, vinegar-factories, cigar- and cigarette-factories, and flour-mills. The majority of the factories are small and employ from 20 to 30 hands; but a few of them employ 60 or more. There are in these shops and factories 598 Jewish laborers, almost exclusively men. The women and children take little part in the work of the factories. The number of Jewish poor in Kishinef in proportion to the entire Jewish population is considerable, and increases from year to year. In 1895 the number of destitute Jewish families applying for aid was 808; the number in 1896 was 1,131; in 1897 it was 1,006. The increase of poverty appears even more clearly in the number of families that apply for aid for Passover: 1,200 in 1895; 1,142 in 1896; 1,450 in 1897; 1,494 in 1898; 1,505 in 1899; 2,204 in 1900. This rapid increase in the number of Jewish poor is explained, aside from the legal and economic conditions of Jewish life in Russia, by personal administrative oppression at the hands of the governors of Bessarabia. Among the innumerable cases which illustrate the tyranny of the administration it is sufficient to cite one, in which Jewish merchants and laborers are prohibited from going to the stone-quarries situated ten versts from Kishinef, the prohibition being justified by the assertion that Jews have no right to live outside cities or boroughs! In 1898 the various charitable institutions of Kishinef united, with official sanction, under the name of "the Society in Aid of the Poor Jews of Kishinef." The activities of the society include the supply of cheap fuel to the poor and the distribution of aid for the Passover. There are four committees of charity: the committee in charge of the dining-hall and tea-house for the poor; the orphan asylum committee; the committee for the care of sick women; and the committee for the care of poor children. The total income and expenditure of the society for 1900 were each 32,220 rubles. The sum assigned from the Basket-tax for charitable work in Kishinef (according to the census of 1900) was 58,526 rubles. Of this sum, 35,000 rubles were expended on the support of a Jewish hospital and dispensary, and about 10,000 rubles on the support of a Talmud Torah with its industrial school. H. R. M. R.Anti-Semitic Riots. A serious anti-Jewish outbreak occurred in Kishinef April 19-20, 1903, during which 47 Jews were killed, and 92 severely, and 500 slightly, injured. Great material losses were inflicted on the Jewish community: 700 houses were destroyed; 600 stores were pillaged; 2,000 families were utterly ruined. The outbreak undoubtedly had been planned beforehand, and was not in any degree spontaneous. For six years previous to the outbreak a certain Pavolachi Krushevan, the Moldavian editor of the only daily paper in the city, the "Bessarabetz," had carried on a campaign against the Jews, publishing various false accusations against them, and not even hesitating to accuse them of ritual murder. Having poisoned the minds of the Christian population, Krushevan availed himself of the opportunity created by the murder of a boy (by his own relatives) in an adjoining village, and the suicide of a Christian girl in the Jewish hospital of Kishinef; he laid both tragedies at the door of the Jews, declaring emphatically that both were murders committed for ritual purposes; he described the incidents of these "ritual murders" with a wealth of sickening detail, and in inflammatory articles appealed to the people for vengeance. The local government authorities, while aware of the utter falsity of the accusations and of the grave danger of such appeals to passion and ignorance, did nothing. That they were guilty of having contributed to the outbreak is evident, since the "Bessarabetz" was subsidized by the government for the printing of official news, and was thus made an official organ; the vice-governor, Ostrogov, while occupying the position of censor, was himself a collaboratoron the paper; moreover, the police were in open sympathy with the rioters, and made no attempt to interfere; and Davidovich, one of the officials appointed to investigate into the causes and course of the outbreak, had himself participated in the formation of an anti-Jewish organization. The rioters were mostly Moldavians, with a small proportion of Great Russians; some of the latter undoubtedly had been sent to Kishinef for the occasion, under the leadership of a few seminarists and students disguised as laborers. These events called forth expressions of indignation throughout the civilized world, and representations on the subject were made to the Russian government, which refused to take official notice of them. A petition to the czar was prepared in the United States, signed by many thousands of all beliefs, and entrusted to President Roosevelt for transmission to St. Petersburg. The petition, although its text was transmitted to the Russian government in an official despatch, was never sent, for the Russian Foreign Office intimated that it would not be received. During the trials of the numerous persons indicted as participators in the riots the judiciary was openly hostile to the Jews, and most of the rioters received trivial sentences. The unfair attitude of the government officials during these trials created grave apprehensions among the Jews of South Russia; great loss was inflicted upon commerce throughout that region, and hundreds of Jewish families were impelled to emigrate to other countries. The cry of horror which went up from the whole civilized world in reference to the massacres at Kishinef was followed by a cry for justice and by a demand that the affair be investigated and the guilty ones punished. Public opinion in Europe and America was aroused to such a pitch that the Russian government was obliged to institute legal inquiries. "Justice will take its course," said Murawyev, minister of justice, who desired to pacify indignant Europe; but in this case justice could take only the course carefully marked out for it. Anything else would have meant disaster to the definite anti-Semitic policy of the government, and would have implicated high government officials. This, of course, was not to be thought of. Russian policy is known to be persistent, though it sometimes appears to give way to the representations of others. Accordingly legal proceedings were instituted, but the conduct of them proved only a mockery of justice. The trial was to be kept strictly secret; and no newspaper might publish the slightest mention of the proceedings. 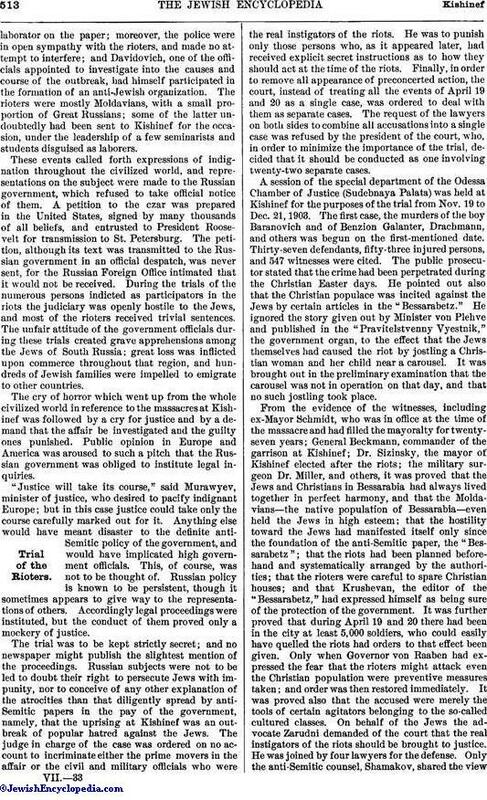 Russian subjects were not to be led to doubt their right to persecute Jews with impunity, nor to conceive of any other explanation of the atrocities than that diligently spread by anti-Semitic papers in the pay of the government, namely, that the uprising at Kishinef was an outbreak of popular hatred against the Jews. The judge in charge of the case was ordered on no account to incriminate either the prime movers in the affair or the civil and military officials who were the real instigators of the riots. He was to punish only those persons who, as it appeared later, had received explicit secret instructions as to how they should act at the time of the riots. Finally, in order to remove all appearance of preconcerted action, the court, instead of treating all the events of April 19 and 20 as a single case, was ordered to deal with them as separate cases. The request of the lawyers on both sides to combine all accusations into a single case was refused by the president of the court, who, in order to minimize the importance of the trial, decided that it should be conducted as one involving twenty-two separate cases. A session of the special department of the Odessa Chamber of Justice (Sudebnaya Palata) was held at Kishinef for the purposes of the trial from Nov. 19 to Dec. 21, 1903. 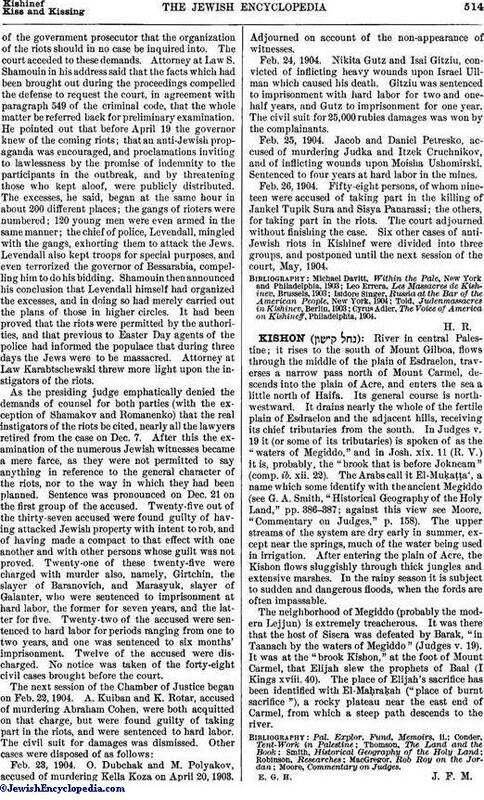 The first case, the murders of the boy Baranovich and of Benzion Galanter, Drachmann, and others was begun on the first-mentioned date. Thirty-seven defendants, fifty-three injured persons, and 547 witnesses were cited. The public prosecutor stated that the crime had been perpetrated during the Christian Easter days. He pointed out also that the Christian populace was incited against the Jews by certain articles in the "Bessarabetz." He ignored the story given out by Minister von Plehve and published in the "Pravitelstvenny Vyestnik," the government organ, to the effect that the Jews themselves had caused the riot by jostling a Christian woman and her child near a carousel. It was brought out in the preliminary examination that the carousel was not in operation on that day, and that no such jostling took place. From the evidence of the witnesses, including ex-Mayor Schmidt, who was in office at the time of the massacre and had filled the mayoralty for twenty-seven years; General Beckmann, commander of the garrison at Kishinef; Dr. Sizinsky, the mayor of Kishinef elected after the riots; the military surgeon Dr. Miller, and others, it was proved that the Jews and Christians in Bessarabia had always lived together in perfect harmony, and that the Moldavians—the native population of Bessarabia—even held the Jews in high esteem; that the hostility toward the Jews had manifested itself only since the foundation of the anti-Semitic paper, the "Bessarabetz"; that the riots had been planned before-hand and systematically arranged by the authorities; that the rioters were careful to spare Christian houses; and that Krushevan, the editor of the "Bessarabetz," had expressed himself as being sure of the protection of the government. It was further proved that during April 19 and 20 there had been in the city at least 5,000 soldiers, who could easily have quelled the riots had orders to that effect been given. Only when Governor von Raaben had expressed the fear that the rioters might attack even the Christian population were preventive measures taken; and order was then restored immediately. It was proved also that the accused were merely the tools of certain agitators belonging to the so-called cultured classes. On behalf of the Jews the advocate Zarudni demanded of the court that the real instigators of the riots should be brought to justice. He was joined by four lawyers for the defense. Only the anti-Semitic counsel, Shamakov, shared the viewof the government prosecutor that the organization of the riots should in no case be inquired into. The court acceded to these demands. Attorney at Law S. Shamouin in his address said that the facts which had been brought out during the proceedings compelled the defense to request the court, in agreement with paragraph 549 of the criminal code, that the whole matter be referred back for preliminary examination. He pointed out that before April 19 the governor knew of the coming riots; that an anti-Jewish propaganda was encouraged, and proclamations inviting to lawlessness by the promise of indemnity to the participants in the outbreak, and by threatening those who kept aloof, were publicly distributed. The excesses, he said, began at the same hour in about 200 different places; the gangs of rioters were numbered; 120 young men were even armed in the same manner; the chief of police, Levendall, mingled with the gangs, exhorting them to attack the Jews. Levendall also kept troops for special purposes, and even terrorized the governor of Bessarabia, compelling him to do his bidding. Shamouin then announced his conclusion that Levendall himself had organized the excesses, and in doing so had merely carried out the plans of those in higher circles. It had been proved that the riots were permitted by the authorities, and that previous to Easter Day agents of the police had informed the populace that during three days the Jews were to be massacred. Attorney at Law Karabtschewski threw more light upon the instigators of the riots. As the presiding judge emphatically denied the demands of counsel for both parties (with the exception of Shamakov and Romanenko) that the real instigators of the riots be cited, nearly all the lawyers retired from the case on Dec. 7. After this the examination of the numerous Jewish witnesses became a mere farce, as they were not permitted to say anything in reference to the general character of the riots, nor to the way in which they had been planned. Sentence was pronounced on Dec. 21 on the first group of the accused. Twenty-five out of the thirty-seven accused were found guilty of having attacked Jewish property with intent to rob, and of having made a compact to that effect with one another and with other persons whose guilt was not proved. Twenty-one of these twenty-five were charged with murder also, namely, Girtchin, the slayer of Baranovich, and Marasyuk, slayer of Galanter, who were sentenced to imprisonment at hard labor, the former for seven years, and the latter for five. Twenty-two of the accused were sentenced to hard labor for periods ranging from one to two years, and one was sentenced to six months' imprisonment. Twelve of the accused were discharged. No notice was taken of the forty-eight civil cases brought before the court. Feb. 23, 1904. O. Dubchak and M. Polyakov, accused of murdering Kella Koza on April 20, 1903. Adjourned on account of the non-appearance of witnesses. Feb. 24, 1904. Nikita Gutz and Isai Gitziu, convicted of inflicting heavy wounds upon Israel Ullman which caused his death. Gitziu was sentenced to imprisonment with hard labor for two and one-half years, and Gutz to imprisonment for one year. The civil suit for 25,000 rubles damages was won by the complainants. Feb. 25, 1904. Jacob and Daniel Petresko, accused of murdering Judka and Itzek Cruchnikov, and of inflicting wounds upon Moisha Ushomirski. Sentenced to four years at hard labor in the mines. Feb. 26, 1904. Fifty-eight persons, of whom nineteen were accused of taking part in the killing of Jankel Tupik Sura and Sisya Panarassi; the others, for taking part in the riots. The court adjourned without finishing the case. Six other cases of anti-Jewish riots in Kishinef were divided into three groups, and postponed until the next session of the court, May, 1904. Cyrus Adler, The Voice of America on Kishineff, Philadelphia, 1904.